Eddie Wayne Boyd, age 81, of Cliff End Street, Williamsburg departed this life on Thursday, November 29, 2018 at St. Joseph East in Lexington. He was born on June 28, 1937 in Williamsburg to the late Edwin Moss Boyd and Della (Burnett) Boyd. He was also preceded in death by his grandson, Bradley Allen Boyd Jr.; sister, Bonnie Guinn and a brother, Bernard Crockett. Eddie taught and coached at Williamsburg City School. 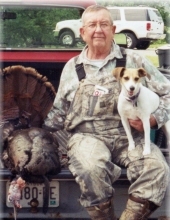 He was an avid outdoorsman who loved spending time with family and friends. He was co-owner of Kingfisher Jigs. He is survived by his loving wife, Margie (Beavers) Boyd of Williamsburg; two sons, Buck Boyd of Brandon, Mississippi and Bradley Boyd of Williamsburg; three stepdaughters, Kelli Paul of Woodbine, Krystal Barton (Doug) of Woodbine and Tish Williams (David) of Dallas, Texas; 11 grandchildren, Micah Boyd, Hayden Boyd, Alicia Boyd-Williamson, Ashley Boyd-McHenry, Kaylen Boyd, Austin Paul, Adrianna Paul, Cody Collett, Jenny Collett, Brystal Barton and Aaron Williams; 4 great grandchildren, Addison, Berkley, Lincoln and Ava; several nieces and nephews; and a host of other family and friends to mourn his passing. Visitation will be from 2:00 P.M. until the funeral hour on Sunday, December 2, 2018 at the First United Methodist Church in Williamsburg. The Funeral Service will be at 4:00 P.M. Sunday, December 2, 2018 at the First United Methodist Church with Rev. Toy Adams officiating and special music provided by Sue Watson. Graveside Services will be at 11:00 A.M. Monday, December 3, 2018 at the Croley Addition of Highland Park Cemetery where he will be laid to rest following Military Graveside Honors conducted by the American Legion Post # 88 of Corbin. To send flowers or a remembrance gift to the family of Eddie Wayne Boyd, please visit our Tribute Store. "Email Address" would like to share the life celebration of Eddie Wayne Boyd. Click on the "link" to go to share a favorite memory or leave a condolence message for the family.